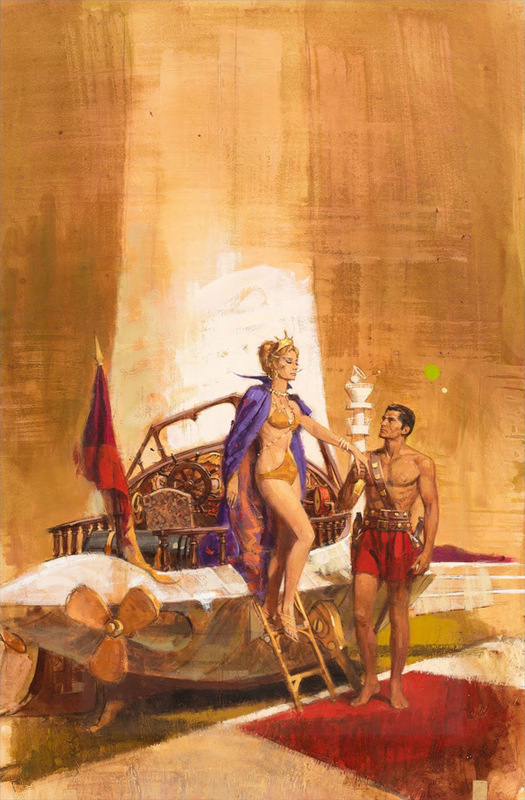 From Catspaw Dynamics: In 1963, Robert K. Abbett was commissioned by Ballantine Books to paint the covers for Edgar Rice Burroughs’ Barsoom series. 1965 saw the addition of John Carter of Mars as the 11th book, and Thuvia received a new cover in 1969. Abbett would also paint a Tarzan series of covers. For the two different editions of Thuvia, I’ve read two stories. The first is that Ballantine accidentally published one of Abbett’s roughs (Thuvia with the banth), and they didn’t correct it until later. The second story is that John Carter helping Thuvia out of the flier was too risque for 1963, what with the skimpy bikini, and going with the more chaste mini-skirt was the compromise until society caught up. I’m sure someone more knowledgable than myself will bring some clarity to this. I like the ship and would have loved to see something like that in the movie instead of those anonymous dragonfly-copters Stanton gave us. A few years ago I saw a similar joyride for children in my local supermarket. It was exactly like I had always imagined a Barsoomian two-man-flier and I was almost tempted to get onboard. I’ve always had special affinity for the Abbett paintings, as I first discovered Barsoom through the Ballantine editions in the ’60s. His covers for “Princess” and “Warlord” remain among my all-time favorites.